how that observing session went, let's mention the Epistemology and Methodology of Cosmology Conference held at UCI over the weekend. This 3-day conference was held Friday through Sunday, but by the time we luckily found out that the conference was going to be held, Friday was all but gone. Thanks to Former Big Oil Scientist, Gabriele, who sent me an email, that happened to show up in her mail box, on the off chance that I would be interested in attending the conference. Yes, indeed, thanks so much, Gabriele. So, I attended the Saturday presentations along with two other science squad members, Was Semiconductor Physicist, Now OCA Astronomer, John, and Math Whiz, Dave. This was a pretty good free conference of physicists and philosophers discussing the issues. The central issue was regarding the current status of the inflation paradigm, which is so effective at solving and explaining three of the major issues in modern cosmology, and yet, there is no agreement regarding the physics behind the inflation phenomena itself. It is almost as if inflation does a good job of fitting the data, so good in fact it is almost a case of just curve fitting the data, but at the same time, it has spawned such a rich search for deeper understanding of the how and why over the past 35 years, that it is hard to imagine that there is not some physical basis for it. Anyway, we had a good time hearing the experts in the field wrangle over how the scientific method operates in real world science. Too bad we missed the Friday discussion. Ok, back to the observing plan and after the sun went down, I setup outside with just the tripod and telephoto setup used last week, but with more dedication to better star hopping this time to ensure that M1 was found in the camera frame. See the camera image below. As you can see, there is not much recognizable in the image and it was not clear if M1 was there or not. But, on further analysis with the help of Astrometry.net, the image was processed and the location of where the camera was pointing was identified. Hooray! the image has where M1 is located, right there in the upper right hand corner, even though it is not visible. It turns out that there is another bright star, Zeta Tauri, right next to dim NGC1988. 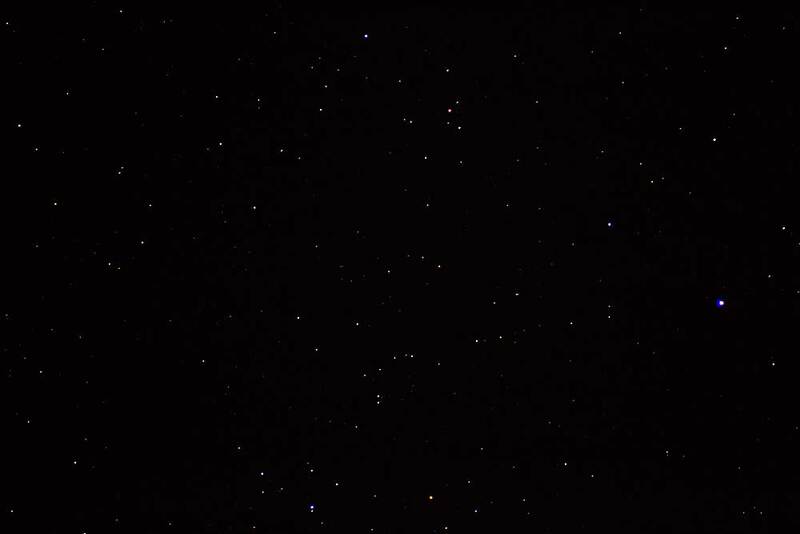 Too bad, I hadn't realized that that star was so close to M1, because I could have used to zero in on the right position. Normally, I can't see magnitude 3 stars in city lights here, but that night, high overhead which helped, the star was just barely visible to the naked eye. Ok, now that we know for sure that M1 should be in the photo, what can we do to find it and measure it? Based on the Astrometry.net analysis, you can see the approximate location in the camera image, but to pin down the location with better accuracy, I used AIP4WIN analysis tools to overlay the known background star locations on top of visible star images in the photo. Then the analysis tools can be used to pinpoint the RA and Dec of where M1 should be located, and the actual pixel x & y - coordinates in the camera image. 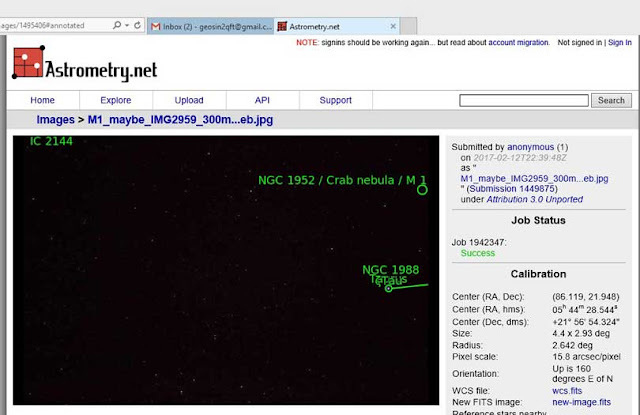 The screenshot below identifies the actual location, identified as "M1-T2", where if M1 is going to be visible, that is where it should show up. But, do we see anything at that exact location where M1 should be found? No, we do not! I tried to stretch the image and enhance it and change the contrast and such as that and still could not really see much there. So what is going on? 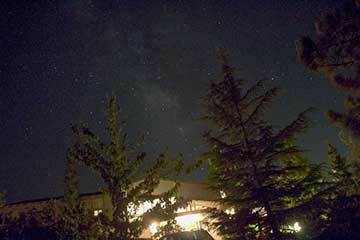 Is it the case that the night sky with city lights pollution is just too bright to see the dim M1? Remember that M1 has apparent magnitude 8.4 and surface brightness = 21.4 (Remember we calculated this SB in the last post) and the Dark Sky Meter application measured the night sky at magnitude 16.4. So, it is entirely possible that the sky is just to bright to see the dim M1. But as you recall, I was a little bit suspicious that the DSM app was overstating the brightness because of all the clouds and such that were reflecting city lights back down toward the ground where the DSM was doing its measurement. Regardless, we can conduct our own measurement of how much light actually shows up in an aperture of 9 arc minutes, located at the exact position where M1 should be found and see how much light is found there. 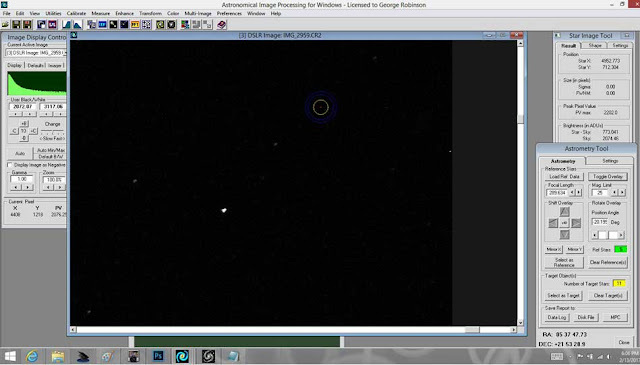 Remember, the software calculates the total amount of light within the smaller 9 arc minute aperture and subtracts the background light in the wider circular area, which should just contain background light, not any stars. The 9 arc minute aperture is chosen to just match the size of M1, which is listed as 8 arc minutes. The screenshot below is a magnified portion of the previous screenshot showing a white circle positioned at the same location where M1 should be. The photometry for that location shows the amount of light within the aperture is higher than the background light around the aperture. But is this quite small amount of light representative of something being there or is it just random noise? Well, I examined a dozen or so locations chosen at random to see what a random location would look like. Check out the screenshot below where we can see that for a typical location the amount of light in the aperture, the same size as M1, the Star-Sky is only 773, almost always only about 10% and often less that that for the location where M1 should be. 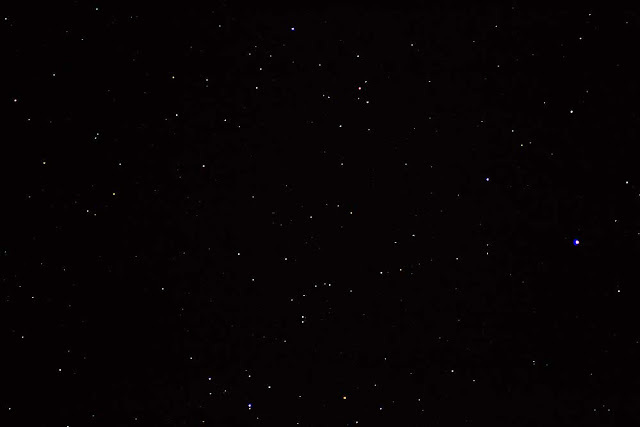 For some random readings, the value was negative, indicating that not much light was in the small aperture, but maybe some dim star was in the outer diameter, so that the overall ADU count was negative. So, something seems to be hiding at the M1 location. So, even though there seems to be extra light showing up where M1 should be, it is not enough say that M1 is actually poking through the sky background noise. How much light should be there in comparison to a completely dark sky? 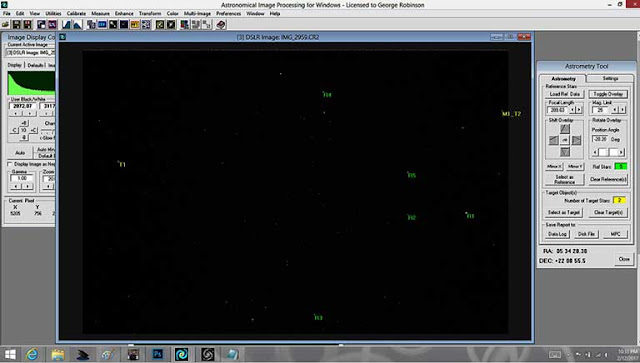 We can calculate how much light should be there by looking at how sensitive the camera is to known magnitude stars. Recently, as described in the recent February 5 post on the background stars that should be observed during the August 2017 solar eclipse, and we used the bright star Regulus, magnitude 1.4, as a reference star. The measured value of light in that 4 second exposure was 2.7 x 10^6 ADU. If we adjust this value to represent what would be measured with an exposure time of 2 seconds and ISO =1600 instead of 200, eight times more gain, then the same magnitude star would show up as 10.8 x 10^6 ADU with these new camera settings. But, we can compare how the light for a magnitude 1.4 star should compare with M1 with apparent magnitude 8.4. We can then calculate that 8.4 - 1.4 = 7 = 2.5 * log(Adjusted ADU for Regulus / Expected ADU for M1 ), for which we calculate that the M1 measurement should be 17,116 ADU, not 6,028. So, it does appear that the background sky is too bright. But we do measure a little bit more light around where M1 should be compared to the background sky light, so we can very nearly see M1 in city lights, but it is not enough to actually be able to see an image of M1. Using a tracking mount so that longer exposure times on M1 location are not expected to improve the situation. The current plan for observing M1 is then to wait until we can be in darker skies. The next OCA Black Star Canyon observing session is a possibility, but the weather forecast is for rain, so I'm not holding my breath.